Hope you had a great Memorial Day weekend! I was in Atlanta for my nephew's first birthday, so I got to experience some real summer heat in addition to getting in some quality baby time. It was a great weekend - one of the highlights was witnessing my nephew's first taste of cake and ice cream, which was quite a sight to see. What did you do over the weekend? I bet there was grilling involved, for those of you lucky enough to have outdoor space for a grill. I don't have a grill, but I did break out the cast iron grill pan last night for this salad. I first had grilled lettuce a couple months ago at a restaurant and really liked it - the lettuce gets a bit of char and wilts slightly, but stays mostly crisp. I also love Caesar salad, so I was excited to try this recipe when I saw it in a recent issue of Cooking Light. The grilling adds a little something extra to the salad, and the garlic toasts are a nice substitution for croutons. Definitely a great recipe for summer! I am writing the recipe with instructions for using a grill pan on the stovetop, since that is the way I did it. If you have a grill, then feel free to use it. Also, I kept the anchovies somewhat minimal here - if you want more, you can add some chopped anchovies to the finished salad. In a blender or mini food processor, combine 2 garlic cloves, anchovies, lemon juice, mustard, pepper, salt, and egg yolk. Blend until smooth. Add olive oil and blend until smooth. Refrigerate dressing until ready to use (you may need to blend again or whisk it together after you remove it from the fridge). Brush grill pan with canola oil and heat over medium-high heat. Lightly coat both sides of bread slices with cooking spray. When grill pan is very hot, place bread on pan and cook for about 2 minutes per side, until bread is golden and has grill marks. Remove bread from pan. Cut remaining garlic clove in half and rub it over both sides of the bread slices. Place lettuce, cut sides down, on the grill pan. Grill for 2 minutes, then turn lettuce over. Grill for 1 minute, then remove lettuce from heat. Coarsely chop lettuce and place it in a large bowl. Toss lettuce with dressing. Divide salad among plates and top with grated cheese. Serve with toasted bread slices. 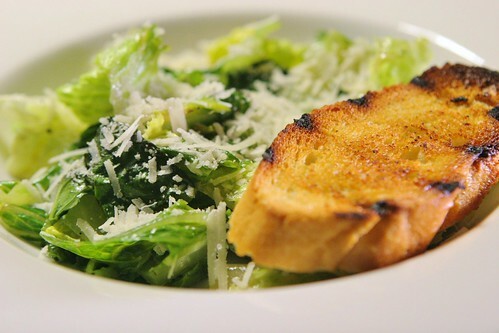 I love, love, love me some Caesar salad! Your grilled version sounds extra yummy! I've always wanted to grill lettuce. Sounds excellent!